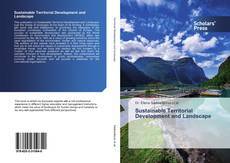 Sustainable Territorial Development and Landscape, 978-620-2-31084-0, 6202310847 ,9786202310840 by Dr. Elena Sadovnikova et al. This publication on Sustainable Territorial Development and Landscape puts the theme of landscape at the heart of its thinking. It contributes, with great skill and intelligence, to promoting the messages of the European Landscape Convention of the Council of Europe. The concept of sustainable development was sponsored by the World Commission on Environment and Development (WCED), which was convened by the UN in 1983 as a result of growing concerns about the rapid degradation of the environment, human and natural resources. The authors of this volume have invested in it their living vision and their joy to talk about the issues of sustainable development through a landscape theme, and we hope that readers will find answers to a number of their essential questions as well as feel and share the optimism inherent in true development. Indeed, this compendium will contribute to the development of public administration, universities curricula, public servants and will provide a database for the international organizations. Dr. Elena Sadovnikova et al. Landscape convention, Council of Europe, international co-operation, rural future, climate change, agriculture, Culture, Heritage, Greece, spatial planning, Economy, human impact, cross-border thinking, SAIMAA GEOPARK.